It’s that time of year again! The days are a little shorter and drier, so bougainvillaea begins to bloom and brighten up our landscapes with splashy displays of color. Bougainvillaea is actually a climbing shrub from the island of Bougainville in the south Pacific where it winds its way up through the trees to lie atop the canopy. It is not a vine since it does not have tendrils with which to cling, so it must be trained and contained. Some varieties are trained to climb over wooden arbors or wire frameworks attached to buildings. Worth Avenue, Palm Beach’s most famous shopping area, is known for its decades-old vines which climb up the columns along the street. For residential and bedding use, some varieties have been developed which remain tight in their growing habit so they are well suited for use as bedding plants. 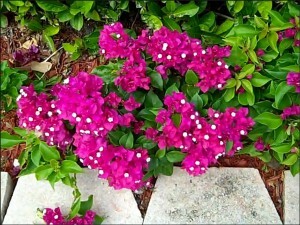 Bougainvillaea adds color to the landscape as evidenced by this planting below seen in Marina Gardens. 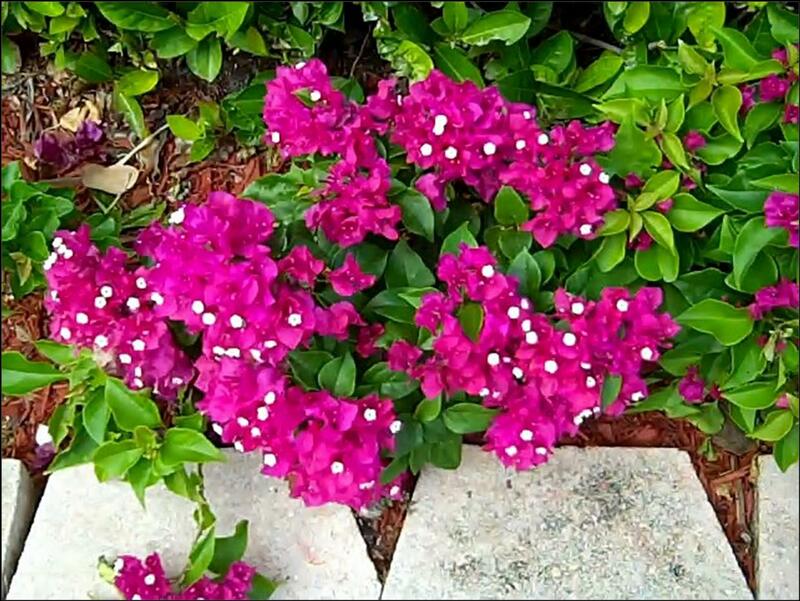 Communities where you might see a lot of bougainvillaea this time of year include Admirals Cove in Jupiter, BallenIsles in Palm Beach Gardens and at the Gardens Mall in Palm Beach Gardens. To see all homes listed for sale in Admirals Cove, BallenIsles or Palm Beach, visit me on the web. Posted in Admiral's Cove homes, BallenIsles Homes, Ritz Carlton homes for sale on November 2, 2010 at 4:34 am.